family frolics: so glad we brought that. This may seem funny, but when you only have two panniers to your name for 90 days, it is easy to become attached to (and as easily detached from) items in your possession. When we left Amsterdam a few days back, it was a proud thrill to leave a few things behind. We extracted a few items, lightening our load, dawning only what we consider the bare essentials. Between you and I? I have been pruning my pannier pile since April. But now that we are on the road, we are finding a certain satisfaction in removing items, using up your tiny toothpaste, and hiding an extra few Ziploc bags in the slimmest pannier pocket. While having a second pair of sunglasses is nearly ludicrous (we will see how long mine last), a pile of Tums I consider a necessary use of space. We divide and conquer when it comes to technology: Caleb carries one computer, Anthony carries the wi-fi access contraption and James carries a second computer and an impressive pile of cords, connectors and adaptors. I get to go light on technology and instead have the appointed catch-all basket for sweatshirts, jackets, extra beverages/daily snacks and take-along lunch. All of that to say, when packing panniers you really do ‘weigh’ each item. In both senses of the word: is it light or heavy and is it really worth carrying on the back of my bike for all those miles? While we find ourselves leaving things purposefully behind (I am sure the last sweet old lady we stayed with was wondering what to do with James’ size 12 flip-flops), we do have a few things that are worth their weight and more. 1. 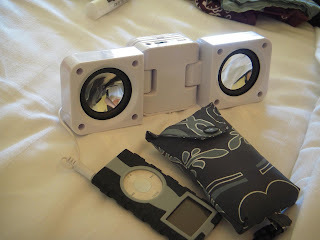 Ipod speakers. Seemed overkill at the time, but Anthony had these speakers and offered to carry them in his panniers. Sure, pal, go for it. Now we are so grateful. In our Amsterdam apartment, our tiny hotel in Alkmaar or whenever we take a couple hour break, these speakers stream whatever music fits our mood. More often than not, some tranquil music offers ample background for writing, journaling, reading and resting. We have already replaced the batteries---twice. 2. Reusable compact storable bag. This item seems like the perfect marketing ploy: just because it is environmentally friendly. But I have to say, it has been a brilliant addendum to our packing in and out, grabbing lunch on the go, and stocking up on water and fruit at the grocers. I think I bought it at Office Depot for a couple of bucks; it is tiny in size, nearly weightless and ever so useful. 3. My rear pannier basket (on back of bike, see pic). It is a brilliant catch-all and saves us time and headache. We can easily throw in lunches and extras, so nobody has to unpack and repack panniers mid route. We are most happy when its contents are a mid-morning snack of chocolate croissants and apple turnovers. We find it quite easy to indulge in sweet treats when we have ridden 6 miles with another 8 to go. Caleb unabashedly adores chocolate; Anthony loves the gamut.